A man holds national flags of Eritrea (left) and Ethiopia as he waits for the arrival of Eritrea's president at the airport in Gondar, nothern Ethiopia, in November. 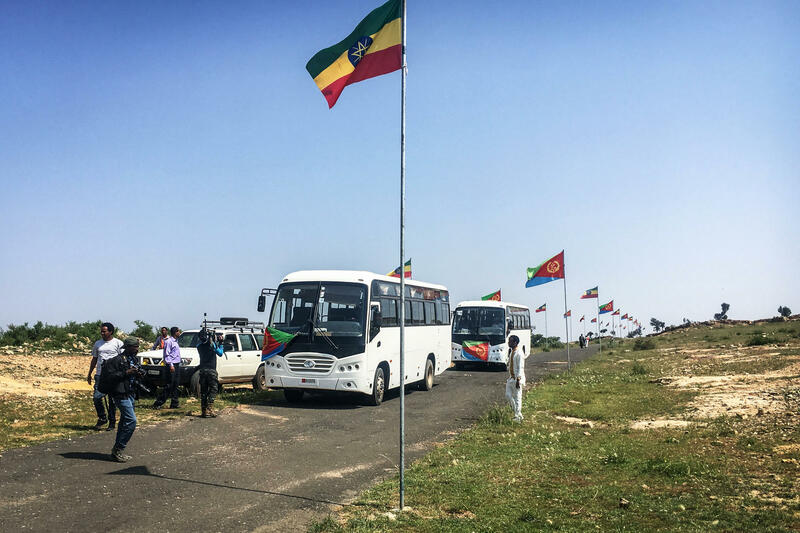 National flags are seen along the road to Eritrea in Zalambessa, northern Ethiopia, in September before a border reopening ceremony. Two land border crossings between Ethiopia and Eritrea were reopened for the first time in nearly 20 years. About a mile from the Eritrean border in Zalambessa, Ethiopia, there's a small building made of corrugated metal. There's not much inside, except for some sleeping mats and clay pots for coffee. But dozens of Eritreans have made it into a home, while they wait for the Red Cross to take them to refugee camps. Over the past year, Ethiopia has stunned the world with its democratic reforms and warming relationship with neighboring Eritrea. The two countries have formally ended their 20-year conflict and reopened land crossings to allow people and goods to move freely between them. Now, a big question fills the air in the region: Will the dramatic transformation in Ethiopia spread to Eritrea, which is often referred to as the North Korea of Africa? Sirak, 17, came to Ethiopia from Eritrea more than a month after the border opened in September. He wants only his first name used because he is afraid Eritrean authorities could seek retribution for his actions or criticism. Now, he spends his time walking around Zalambessa, marveling at the lack of troops on the streets and the frankness of conversations. He says his family's home in Eritrea was demolished by the government, and police wanted to know why they had built the house without permission. "The police were coming every day, so everyone was hiding in the bush," he said. Forced evictions and home demolitions have been a well-documented form of political retribution in Eritrea, whose government has never held an election and has been accused of brutal human rights abuses almost since its independence in 1993. Asked if he believes things can change in Eritrea, Sirak demurs. "It's impossible," he says. "It won't change." Sirak appears meek and fearful compared with today's Ethiopians, who are celebrating their newfound freedoms with swagger. Long under authoritarian rule, now Ethiopians can gather in groups to talk freely. They can criticize their government without fear they'll be arrested. Many Ethiopians along the border say Eritrea has to change also. They say when Eritreans come to Ethiopia, they will experience a freer society and they will demand the same at home. "It's not fair to make that comparison," says Salem Solomon, an Eritrean-American journalist who covers the two countries for Voice of America. Ethiopia and Eritrea have completely different political systems, she says. Salem lived in Eritrea until 2007; she went through military training and worked for the Information Ministry before she came to the United States. In Eritrea, says Salem, the government is omnipresent — the command economy and mandatory military service are just some of the ways it controls people's lives. Salem says the government stays in power by doling out unpredictable punishments. That creates an atmosphere of intense fear. "Even those who feel like they are so loyal and [are] vocal [about their] support for the government," even they, she says, are not safe. Awet Weldemichael, who studies Eritrea at Queen's University in Canada, says another reason to be skeptical about any potential uprising is that Eritrea has been "hemorrhaging" youth. Eritreans have been leaving the country by the thousands since it gained independence from Ethiopia in 1993. Scholars estimate that a third of Eritreans live outside the country. And since the borders with Ethiopia reopened in September, about 10,000 Eritreans have sought asylum in Ethiopia. "And so in light of that ... the agents of change are not there," says Awet. If change is to come, he says, it is unlikely to happen the way it did in Ethiopia, forced by years of protests. Instead, if change comes, it will most likely have to be pushed from the top. Awet does warn, however, that Eritrea is such a closed country, it's hard to make predictions. "What I can tell you confidently," he says, "is that the current course is unsustainable for Eritrea." In November, the United Nations lifted sanctions against Eritrea. But that's unlikely to help, because it was mostly a weapons ban. Eritrea remains one of the poorest countries on the continent. Most of its people live below the poverty line, and 80 percent are subsistence farmers in a land susceptible to droughts. Over the years, Awet says, the population has been decimated by migration and by mass incarceration, and many helpful institutions have been destroyed or have ceased to exist. In Badme, a border town about 200 miles west of Zalambessa, the border crossing is not yet officially open. Eritrean officials have warned that the road into Ethiopia still contains land mines. But one Eritrean mother made her way across anyway. She was trying to hitch a ride back to Eritrea, so she sat right on the border, caressing the cheek of her 9-year-old boy. She's too afraid of the Eritrean government to share her name. Seven months ago, while she was cooking, her son ran away to Ethiopia with a friend. As soon as it became possible, she packed up her things and came to look for him. She found him at a refugee camp outside Badme. She says her boy was not the only kid fleeing Eritrea. She has seen many small children leave their homes and families behind. "They're too young to know anything about the government or democracy," she says. "But what they know is that there is a better life outside of Eritrea." This week, we've been hearing about the changes underway in Ethiopia. 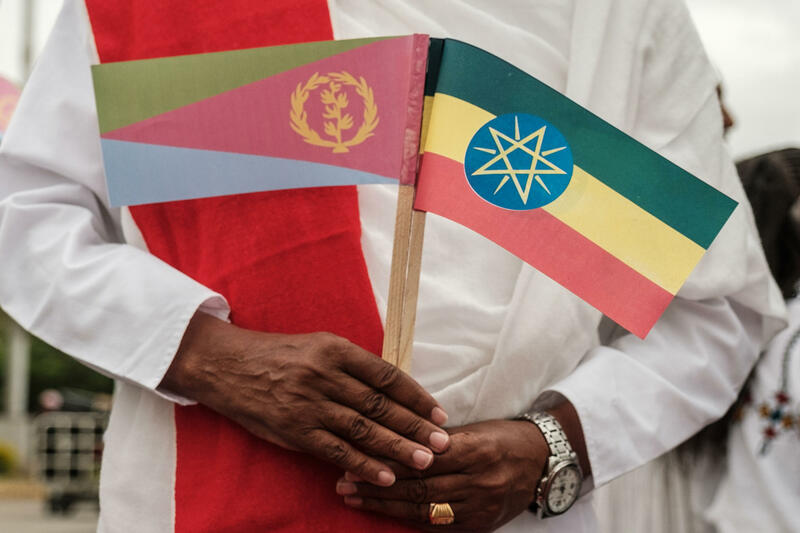 One is that two traditional enemies - Ethiopia and Eritrea - have officially declared peace after decades of conflict. There is now free movement of people and goods between the two countries. But a question still hangs - will the change in Ethiopia, where there is more personal freedom these days, have an impact in Eritrea, which is often referred to as the North Korea of Africa? NPR's Eyder Peralta reports. EYDER PERALTA, BYLINE: About a mile from the Eritrean border in Zalambessa, there's a small building made of corrugated metal. PERALTA: Inside, there are sleeping mats, clay pots for coffee, and dozens of Eritreans who had just crossed the newly open border wait there for the Red Cross to pick them up and take them to a refugee camp. PERALTA: Whole families mill around. I meet Sirak, who's 17. He says he and his family fled Eritrea because their house was demolished by the government. He says police wanted to know why they had built the house without permission. SIRAK: (Through interpreter) The police were coming every day, so everyone was hiding in the bush. PERALTA: Human rights groups call Eritrea one of the most repressive countries in the world. Forced evictions and the demolition of homes have been well-documented forms of political retribution. I ask Sirak if he has any hope that things will change back home. SIRAK: (Through interpreter) It is impossible. It won't change. PERALTA: These Eritreans appear meek and fearful compared to today's Ethiopians, who are celebrating their new-found freedoms with swagger. Now they can gather to talk freely. Many I spoke to say Eritrea has to change also. They say when Eritreans come to Ethiopia, they will experience a freer society. And they will demand the same at home. SALEM SOLOMON: It's not fair to make that comparison because they have two different - completely different political systems. PERALTA: That's Salem Solomon, an Eritrean journalist for Voice of America. She went through military training and worked for the information ministry until she left the country in 2007. In Eritrea, says Salem, the government is omnipresent. They have a command economy. And compulsory military service means they can literally control people's lives. Salem says they also create intense fear by being unpredictable. SOLOMON: The level of unpredictability about repercussions is very important to understand. Even those who feel like they are so loyal and vocal to support the government doesn't mean that they're safe. PERALTA: Eritreans have been leaving their country by the thousands since it gained independence from Ethiopia in 1993. Scholars estimate that a third of Eritreans live outside the country. And since the borders with Ethiopia reopened in September, more than 10,000 Eritreans have sought asylum in Ethiopia. AWET WELDEMICHAEL: And so in light of that, and also in light of the almost two decade of youth hemorrhaging out of the country, the agents of change are not there. PERALTA: That's Awet Weldemichael, who studies Eritrea at Queen's University in Canada. He says if change is to come, it likely won't happen like in Ethiopia. Instead, change will likely come from the top. But he warns that Eritrea is such a closed country it's hard to make predictions. WELDEMICHAEL: But what I can tell you confidently is that the current course is unsustainable for Eritrea. PERALTA: At another border post in Ethiopia, I meet an Eritrean mother and her 9-year-old boy. She's too afraid of the government to share her name. But she says seven months ago, when she was cooking, this little boy fled to Ethiopia. Now that she could, she came to find him. PERALTA: She says, her boy was not the only kid fleeing. They're too young, she says, to know anything about the government or democracy. But what they know is that there is a better life outside Eritrea. Eyder Peralta, NPR News, along the Eritrean border in Ethiopia. Transcript provided by NPR, Copyright NPR.